Want cupcakes that outdo any trendy bakery? 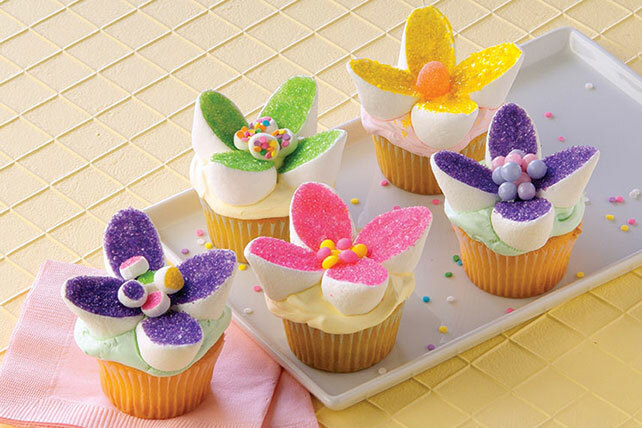 Our simple decorative flowers made from marshmallows and colored sugar will be the tastiest topper at any celebration. Cut large marshmallows diagonally in half with kitchen shears. Press cut-sides in colored sugar. Arrange in flower shape on top of your favorite dessert. Fill center with miniature marshmallow half, cut-side down. Use flowers to decorate pies and frosted cupcakes or cakes. Substitute small gumdrop or pastel candy for the miniature marshmallow half.